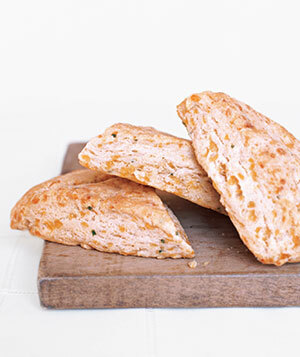 For months, I’ve been trying to track down a recipe for my favorite Cheddar and Chive Scone from Nordstrom Cafe. I even bought fresh chives last week at my produce place with the intent on mixing up a batch. It figures that on a Monday evening, suffering from a sniffly cold and looking for a little something to go with my mom’s homemade chicken tortilla soup, I would halfheartedly attempt a random recipe from..you guessed it.. Real Simple, and voila! A delicious, light and fluffy version that I would say rival the real thing. In a large bowl, combine the flour, sugar, baking powder, and salt. Using a pastry blender or 2 knives held crisscross fashion, cut in the butter until the mixture resembles coarse crumbs. Stir in 2/3 cup of the cream. Add the Cheddar and chives and use your hands to combine; the dough should be crumbly. Knead the dough a couple of times until it comes together. Gently pat it into a ball, then flatten slightly into a 1-inch-thick disk. Transfer to a baking sheet. Slice into quarters. Brush the top with the remaining cream. Bake for about 30 minutes or until golden.